Two out of three of EIA’s measures of natural gas production in the United States set records in 2017. U.S. natural gas production measured as gross withdrawals reached 90.9 billion cubic feet per day (Bcf/d) in 2017, the highest volume on record according to EIA’s Monthly Crude Oil, Lease Condensate, and Natural Gas Production Report. U.S. natural gas production measured as marketed natural gas production also reached a new high, but dry natural gas production did not exceed 2015 levels. Starting in July 2017, U.S. natural gas gross withdrawals increased for five straight months, ultimately reaching a record monthly high of 96.7 Bcf/d in December 2017. Marketed natural gas production also reached an annual record high of 78.9 Bcf/d in 2017 and monthly record high of almost 84.0 Bcf/d in December 2017. 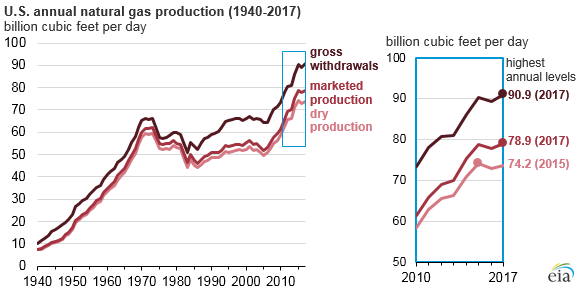 Marketed production reflects gross withdrawals minus natural gas used for repressuring reservoirs, quantities vented or flared, and nonhydrocarbon gases removed in treating or processing operations. Dry natural gas production in 2017 remained lower than previous highs set in 2015 on an annual level at 73.6 Bcf/d. Dry natural gas is consumer-grade natural gas, or marketed production minus extraction losses. As natural gas production increased, the volume of natural gas exports—both through pipelines and as liquefied natural gas (LNG)—also increased. Total natural gas exports grew 36% in 2017, with LNG exports nearly quadrupling. 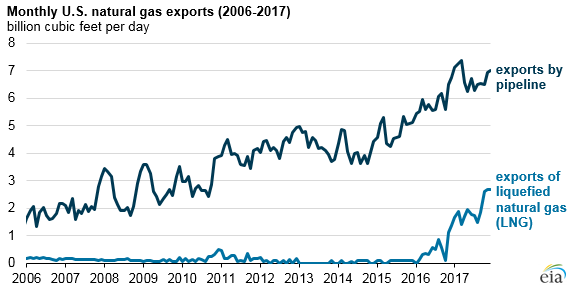 The United States became a net natural gas exporter in 2017 for the first time in nearly 60 years. Louisiana saw the largest total volumetric gain in gross withdrawals in 2017, increasing to 5.8 Bcf/d, up from the state’s 2016 production of 4.8 Bcf/d. Economic and technological advancements and increased drilling have resulted in growth in natural gas production from Louisiana’s Haynesville play. As in 2016, the Appalachian region remained the largest natural gas-producing region. Appalachian natural gas from the Marcellus and Utica/Point Pleasant plays of Ohio, West Virginia, and Pennsylvania continued to grow, with gross withdrawals increasing from 22.2 Bcf/d in 2016 to 24.3 Bcf/d in 2017. Ohio had the largest percentage increase in gross withdrawals of natural gas—up 24% in 2017 to 4.9 Bcf/d. Gross withdrawals of natural gas in Texas declined from 22.2 Bcf/d in 2016 to 21.7 Bcf/d in 2017, which was the largest volumetric decline of any state. However, Texas remained the largest natural gas-producing state with gross withdrawals of nearly 7 Bcf/d more than the next highest state, Pennsylvania.